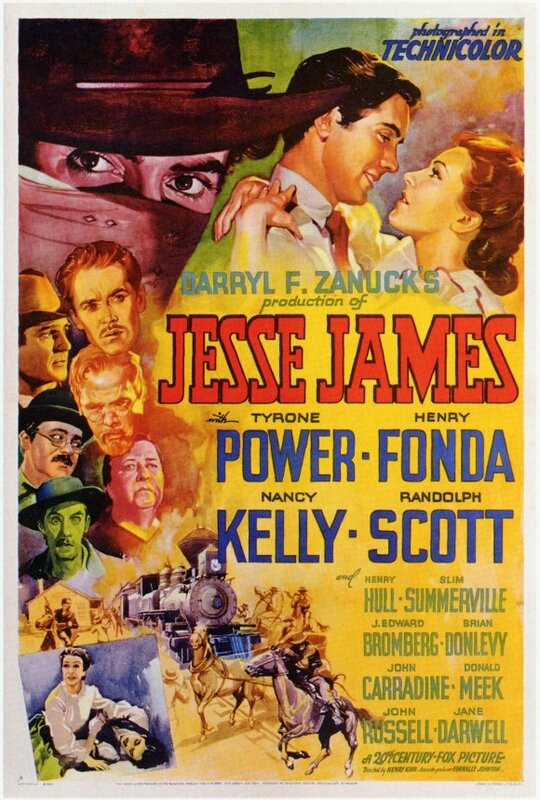 If you had never seen a Jesse James movie, this might not be a bad place to start—not because it’s strongly factual (it isn’t), but because it’s almost pure romanticized legend. 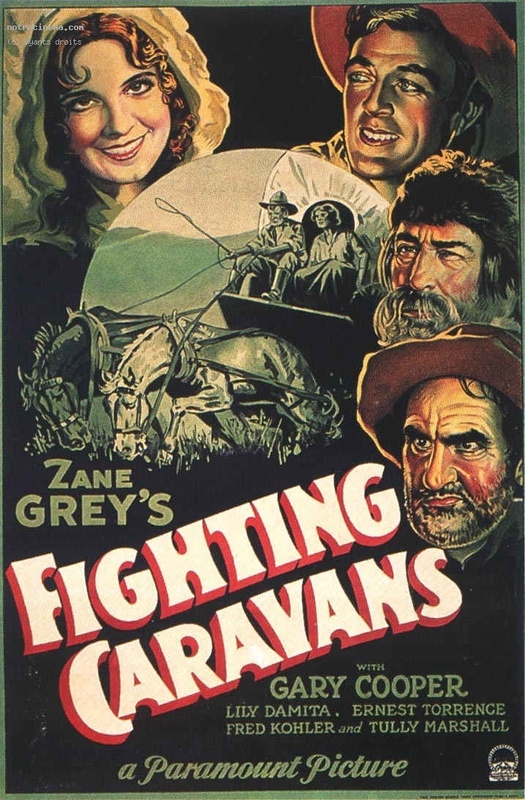 It’s a top-flight big-budget production with a strong cast, a big-name writer and a well-known director, in color at a time when almost all films were in black and white. 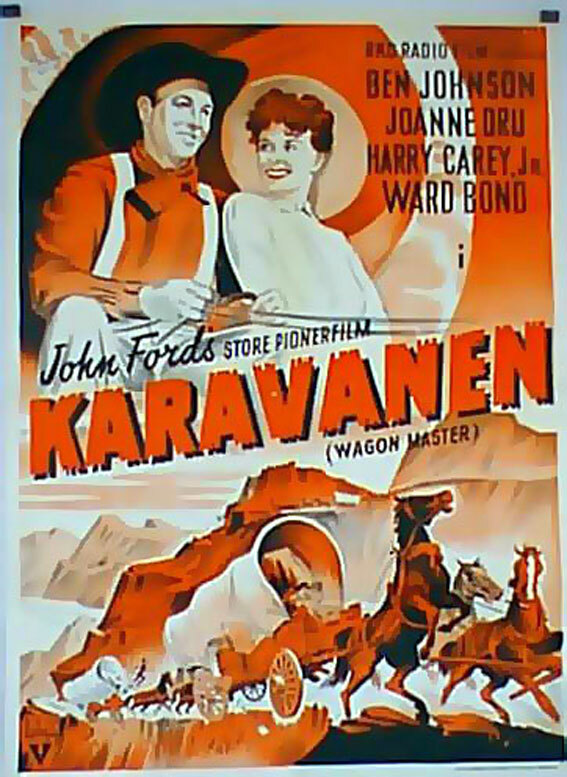 As the film opens, the St. Louis Midland Railroad, in the person of Barshee (Brian Donlevy at his slimiest), is bullying and bamboozling poor, honest Missouri farmers into selling their land for much less than it’s worth. That doesn’t work on the James family of Liberty; their mother, Mrs. Samuels (Jane Darwell) feels poorly but is strong-minded. 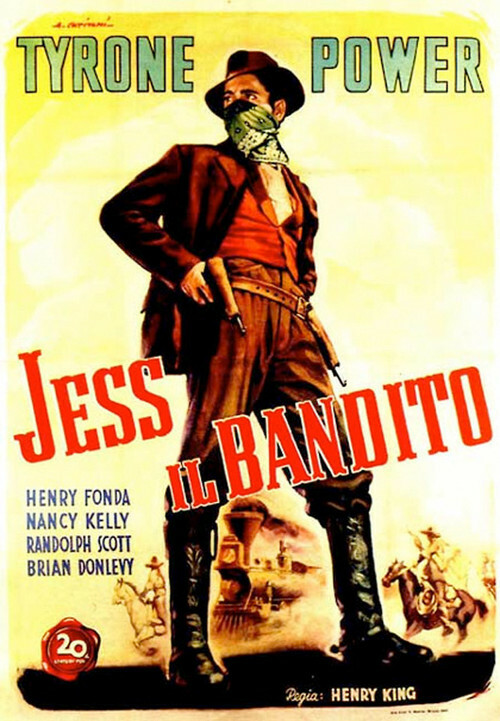 When Jesse (Tyrone Power) shoots Barshee in the hand while he’s trying to use a scythe on Frank (Henry Fonda), Barshee gets a warrant for his arrest. 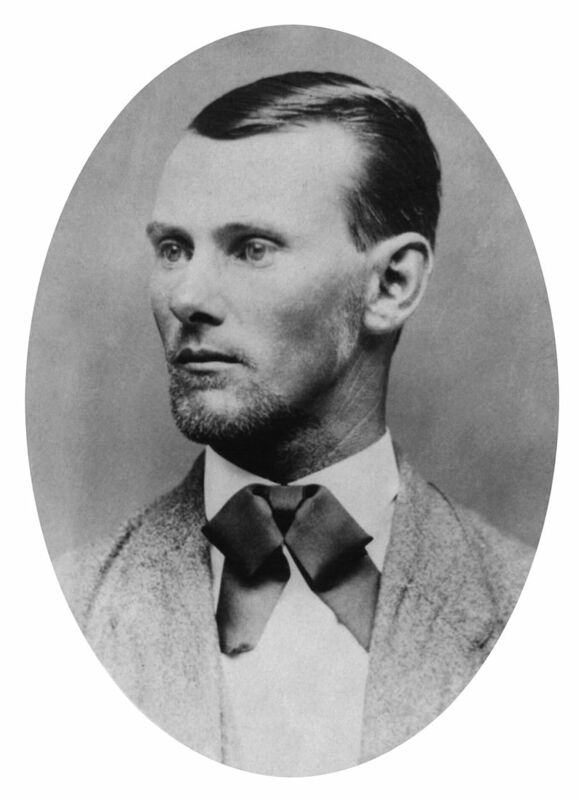 While trying to serve it, he throws a bomb into the room where Mrs. Samuels lies, killing her and starting the James brothers on their outlaw trail for good. Jesse confronts Barshee in a bar, killing him and one of his strong-arm minions. 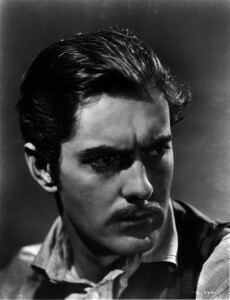 Good ol’ Missouri farm boy Jesse (Tyrone Power) becomes notorious outlaw chieftain Jesse James. Jesse (Tyrone Power) turns himself in to sympathetic Marshal Will Wright (Randolph Scott). Through the craftiness of Frank and the connivance of Will, Jesse is liberated. 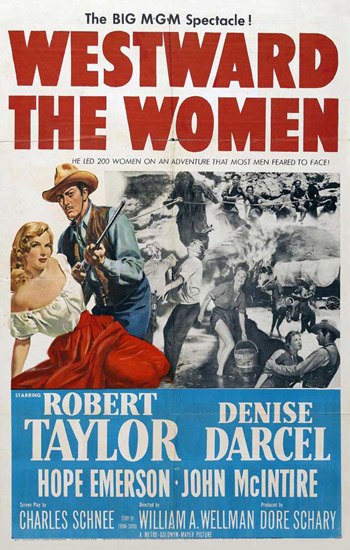 Before resuming his outlaw career, he and Zee are married, but the outlaw life wears on her. 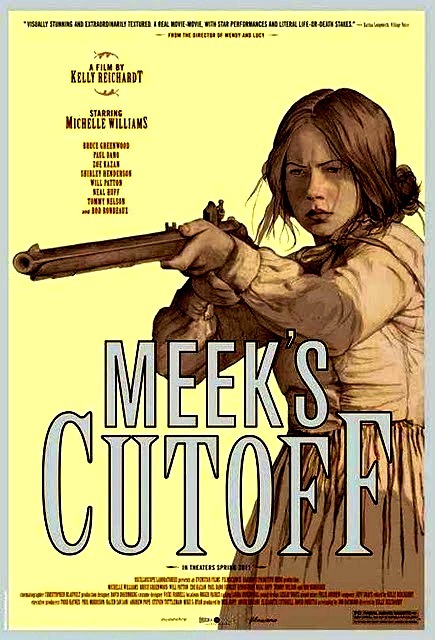 When her son is born, she returns to her uncle’s home in Liberty, and Jesse turns mean. 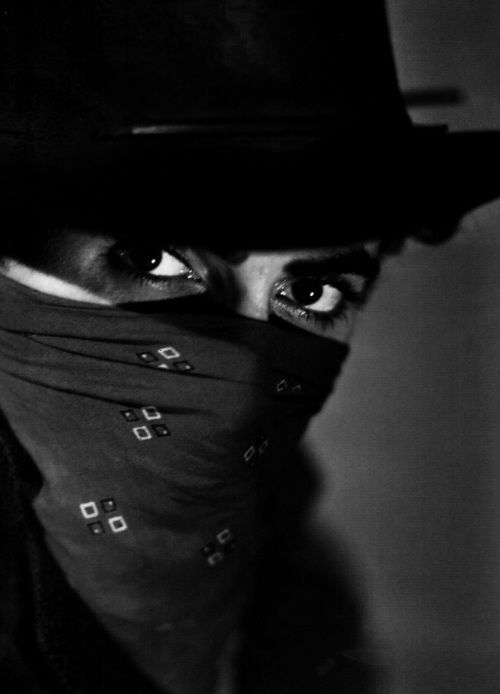 A detective spreads word that if a member of the James gang kills Jesse, he will receive $25,000 and amnesty. 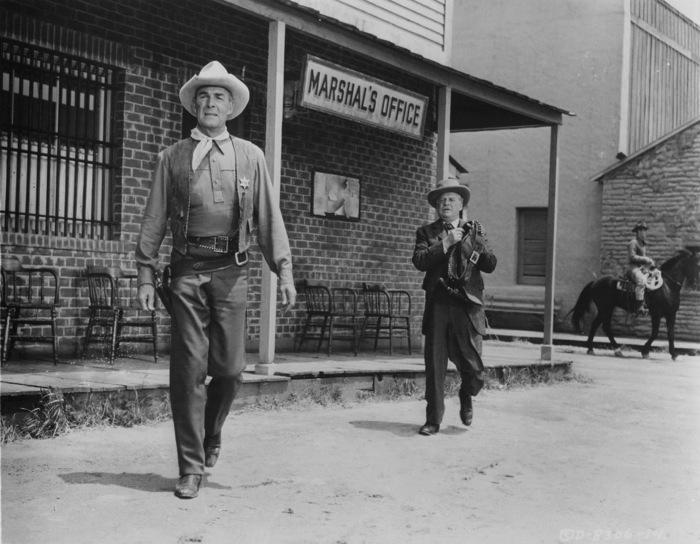 Bob Ford (John Carradine) is tempted, and he warns the detective about the gang’s next job in Northfield, Minnesota. The gang is shot up, Jesse is badly wounded and Frank and Jesse barely escape, desperately jumping their horses through a storefront window and, later in the pursuit, over a cliff into a river. Frank disappears from the story at this point; Jesse escapes his hunters and arduously makes his way back to St. Joseph, where Zee finds him and nurses him back to health. 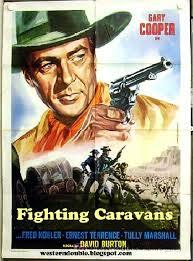 He resolves to take his family to California and go straight. 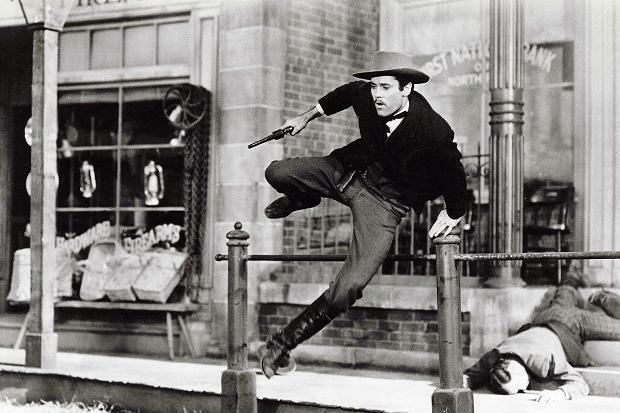 Frank James (Henry Fonda) runs for his horse in Northfield when a bank robbery goes bad. 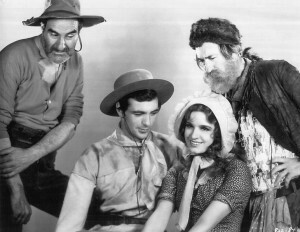 As he is about to catch a train west, he is visited by the Ford brothers, Bob and Charlie. They tell him Frank wants to do a last job, and he is tempted. 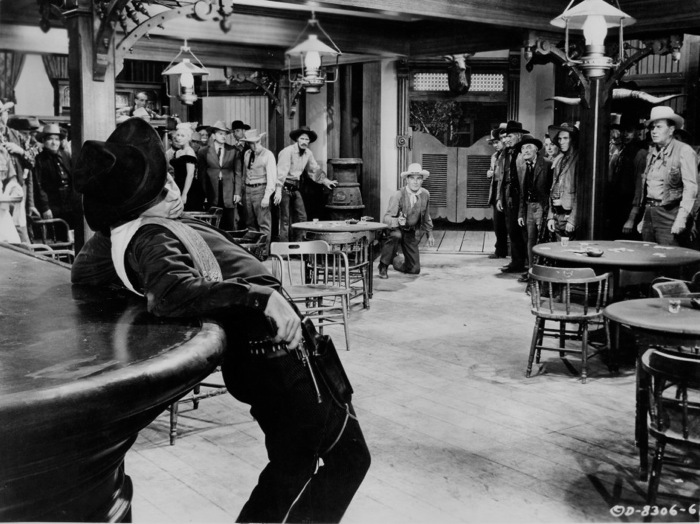 But he refuses, and as the brothers are leaving, Bob shoots Jesse in the back. 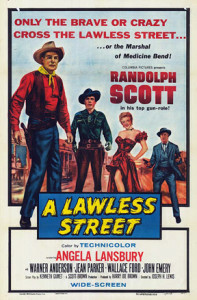 As the film closes, Major Cobb gives a populist eulogy for the deceased outlaw, painting a very sympathetic portrait of him. Many of the members of this cast do very well. Tyrone Power, Henry Fonda, Jane Darwell, Brian Donlevy and Donald Meek are all very good. 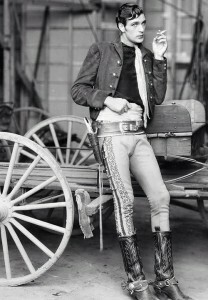 Power was known more for costume dramas, but he made a few good westerns (The Mark of Zorro, Rawhide). Henry Hull quickly becomes tiresome in his role as the hard-drinking editor, the first of a string of those in westerns. 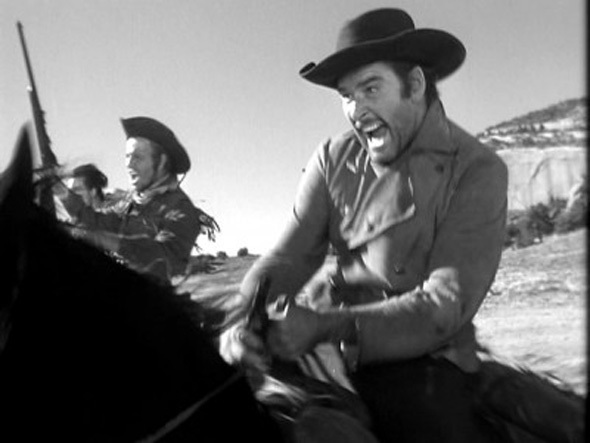 (See, for example, Wallace Ford in Wichita and Edmond O’Brien in The Man Who Shot Liberty Valance.) This is a problem in the writing, as well as in Hull’s overplaying. Nancy Gates as Jesse’s wife Zee often comes across as sanctimonious in her sometimes lengthy ruminations on outlawry and such; again, much of this is due to the writing. 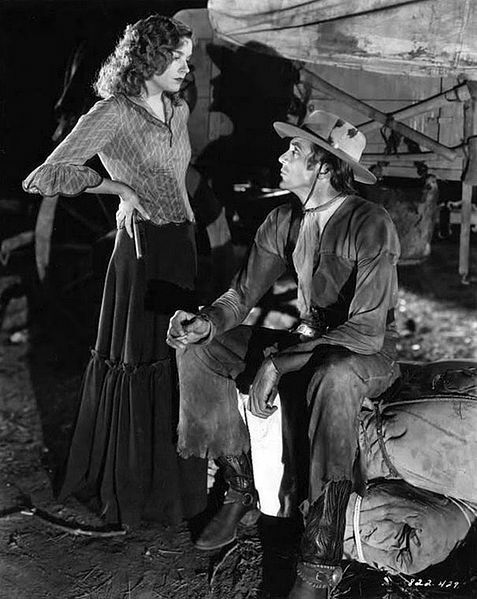 She did not have a robust career, but she appeared in at least one other good western in the same year: Frontier Marshal, also with Randolph Scott. 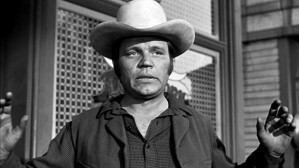 At this point of his career, Scott often played ethical characters with criminal conflicts (Western Union, Virginia City); here he is also conflicted because of his attraction to Zee and his sympathy for the brothers. He’s the most ethical character in the film, although he doesn’t really have much to do. 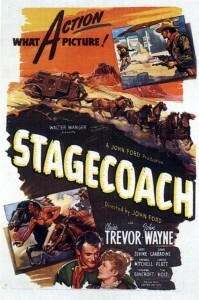 Both Donald Meek and John Carradine would appear the same year in the superb Stagecoach. Although it has occasional bursts of action, there are also several spots where it bogs down slightly with a lot of talk, when Jesse is briefly in jail, when Zee is philosophizing about the outlaw life, or when Major Cobb is dictating another of his cranky, repetitive and tedious editorials. Notwithstanding the pacing problems and talkiness, the technicolor Tyrone Power is always great to look at, and Henry Fonda as Frank is excellent and persuasive. A brooding Tyrone Power as Jesse; and the real Jesse James about the time of his death at 34 in 1882. This would be followed the next year by a sequel. Since Jesse dies at the end of this movie, the sequel is about Frank: The Return of Frank James, with Frank seeking revenge for Jesse’s killing. Henry Fonda as Frank, Henry Hull as the tedious Major Rufus Cobb, Donald Meek as the slippery railroad president, John Carradine as Bob Ford and J. Edward Bromberg as Runyan the detective all reprise their roles. The variations from actual history are too numerous all to be mentioned here. 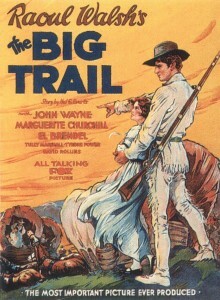 The film makes no mention of the James brothers’ guerrilla history with Quantrill and Bloody Bill Anderson during the Civil War. There are no Younger brothers in the gang; all the members but Jesse and Frank are nonentities. Events like the railroad-sponsored bombing are misplaced and telescoped together in time. Mrs. Samuels was not killed by the incendiary bomb, but she did lose an arm and it killed her youngest son. It was not what started their outlaw careers but came after they were well-established in robbing trains and banks. 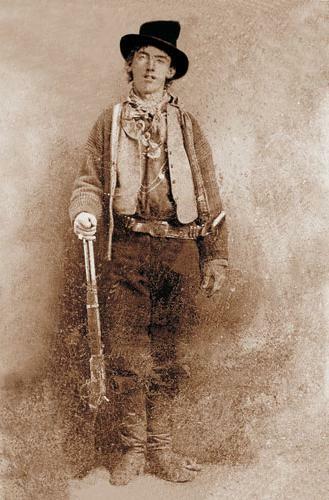 Bob Ford was quite young when he killed Jesse, and he was not a member of the gang on the Northfield raid. 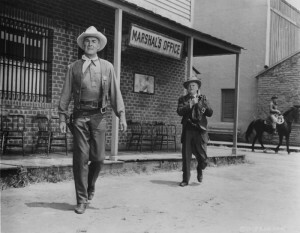 No one gave any warning to authorities in Northfield; the citizenry was just well-armed and prepared not to let its bank be robbed. Jesse was not wounded at Northfield, although other members of the gang were killed or badly shot up (e.g., the Youngers). 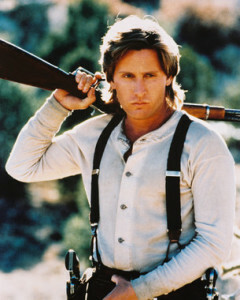 The movie shows Jesse being killed shortly after recovering from his Northfield wounds. 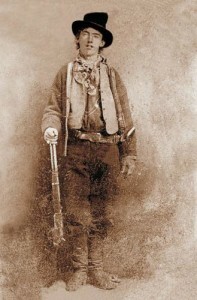 In fact, the Northfield raid was in 1876 and Jesse was killed six years later, in 1882. There is no evidence that Jesse was planning to move to California when he was killed. Jesse was not the Robin Hood figure shown in this movie. 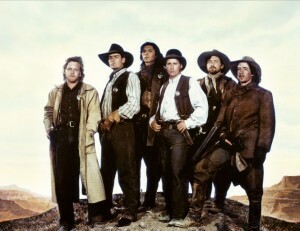 For a more accurate historical depiction of the James brothers and their depredations, see The Long Riders more than forty years later. The film has an unfortunate place in movie history because of a stunt. 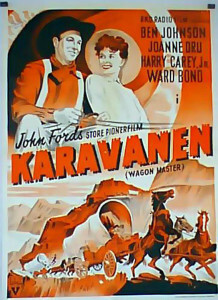 As Frank and the badly wounded Jesse are making their escape from Northfield, they both appear to ride off a 70-foot cliff into a river below. While it appears to be two riders and two horses, the second is simply a closer camera angle of the one stunt, so it looks different. 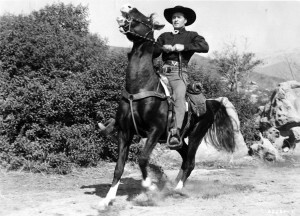 The horse in the stunt was killed, however, which caused such an outcry that it led to the formation of what became the American Humane Association’s Film and Television Unit. Since 1940, the unit has monitored the treatment of animals in movies, and since 1989 the phrase “No animals were harmed during the making of this picture” (a registered trademark) has appeared in the credits of movies for which it is true. The stunt is visually impressive, but knowing what the outcome was dampens the viewer’s enthusiasm. In 1939, the use of color in film was in its infancy. Few movies were in color, like the big productions Gone With the Wind and Dodge City. This was. Director Henry King had been making movies for 25 years at this point, including such notable silent films as Tol’able David and The Winning of Barbara Worth. He was not involved with the sequel. 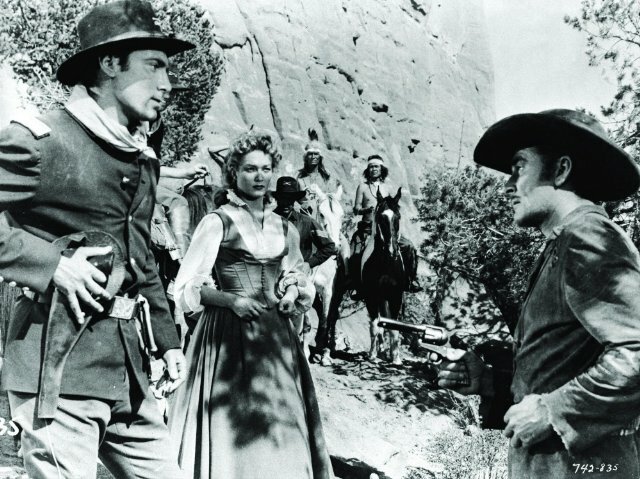 He made several more memorable westerns, including The Gunfighter and The Bravados, both with Gregory Peck, before finishing his long and eminent career more than twenty years later. 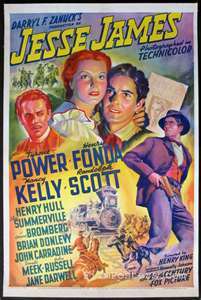 Writer Nunnally Johnson had a newspaper background, like many others of the best writers for movies (Ben Hecht, Charlie MacArthur). 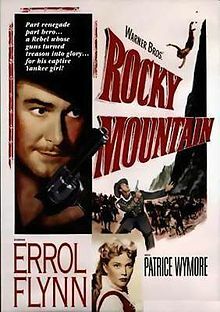 He sometimes played a production role on movies, and he was prominent enough that his name sometimes even appeared with the movie’s title in the credits (“Nunnally Johnson’s Along Came Jones,” for example). 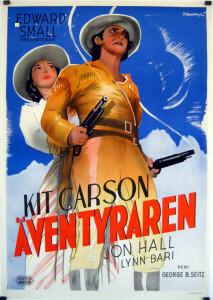 He did not write many westerns, although he did some uncredited work for King on The Gunfighter. 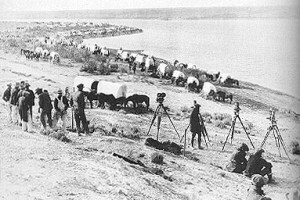 Shot on location in Missouri. 108 minutes long. This entry was posted in Westerns Worth Watching and tagged Henry Fonda, Jesse James, Outlaw Gangs, Randolph Scott, Train Robbing, Tyrone Power on December 24, 2014 by Nicholas Chennault. Many westerns include saloons, gambling and sometimes a card game for high stakes. Among those where card games or tournaments are central to the plot are the following movies. Jodie Foster and Mel Gibson play in Maverick, 1994. 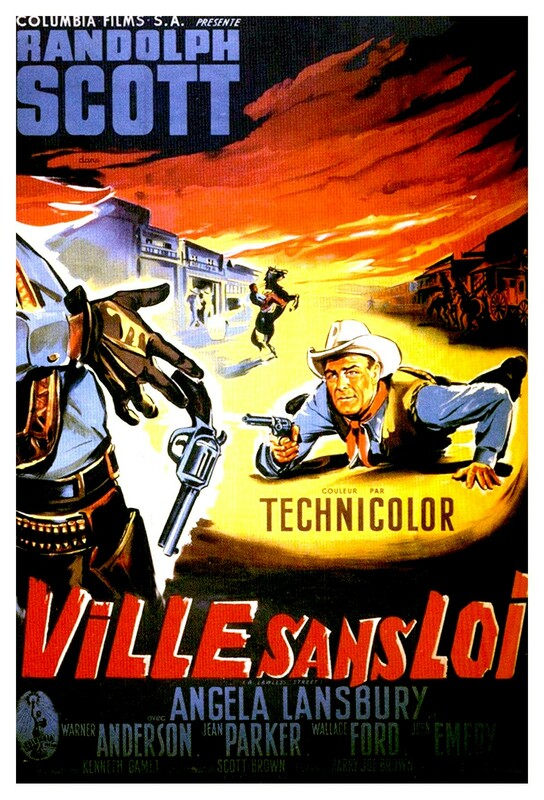 The Iron Mistress (1952): In this fanciful biopic, land speculator and knife fighter Jim Bowie (Alan Ladd) participates in a couple of big games. 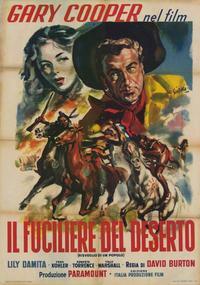 Dawn at Socorro (1954): A Doc Holliday-figure (Rory Calhoun) plays for the future of a dance-hall innocent. 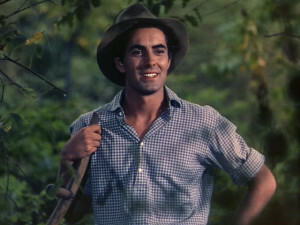 The Mississippi Gambler (1953): Before the Civil War, a riverboat gambler (Tyrone Power) defies the odds and crooked gamblers to play an honest game, amid romantic complications and duels. 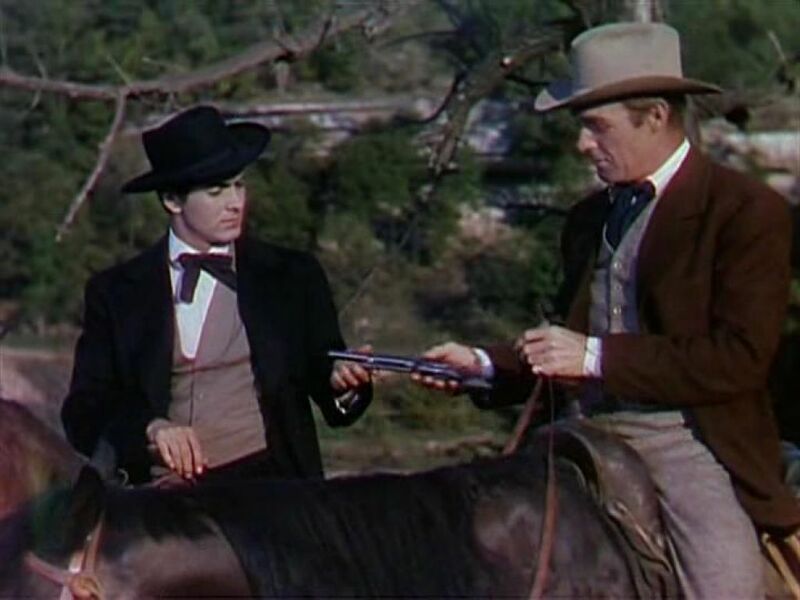 The Gambler from Natchez (1954): An army veteran (Dale Robertson) in the 1840s seeks answers about the death of his gambler father. 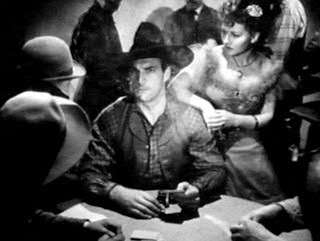 Scalplock (MfTV, 1966): A gambler (Dale Robertson) wins an unfinished railroad in a card game. Big Hand for the Little Lady (1966): A compulsive gambler’s wife (Joanne Woodward) finishes the big card game. 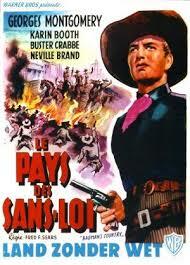 Five Card Stud (1968): A card game leads to a lynching and a series of murders by parties unknown. 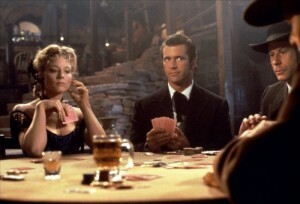 A Thousand Pieces of Gold (1991): The fate of a young Chinese woman in an Idaho mining camp is decided by a card game. Maverick (1994): In this reboot of the 1950s television series, Mel Gibson spends most of the movie trying to raise a stake for the big game, and then plays in it. Triggerman (2009, direct to video): A legendary gambling outlaw (Terence Hill) enters a wild tournament. 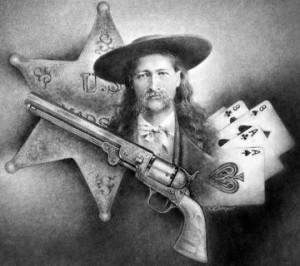 According to western legend, Wild Bill Hickok was holding a hand of black aces and eights in a saloon in Deadwood, Dakota Territory, when Jack McCall killed him from behind in 1876. Since then, that hand has been known as the “Dead Man’s Hand,” a token or predictor of death. 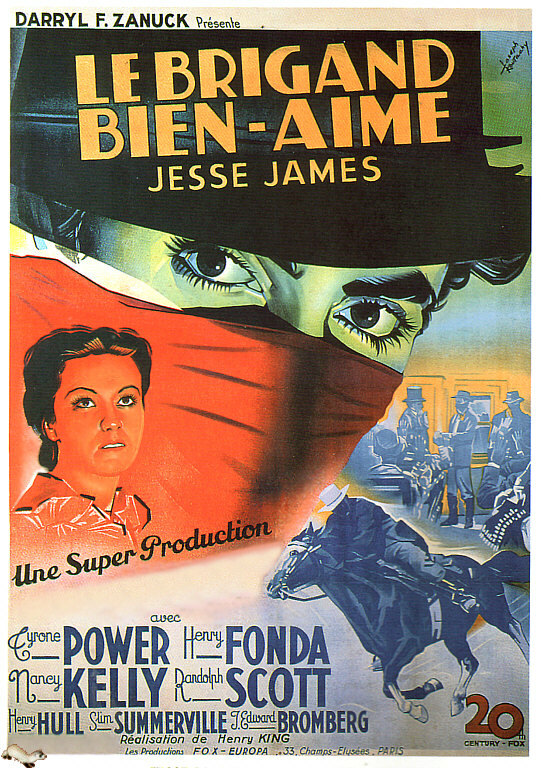 Aces and Eights (1936): Col. Tim McCoy plays for high stakes to save a Mexican family. 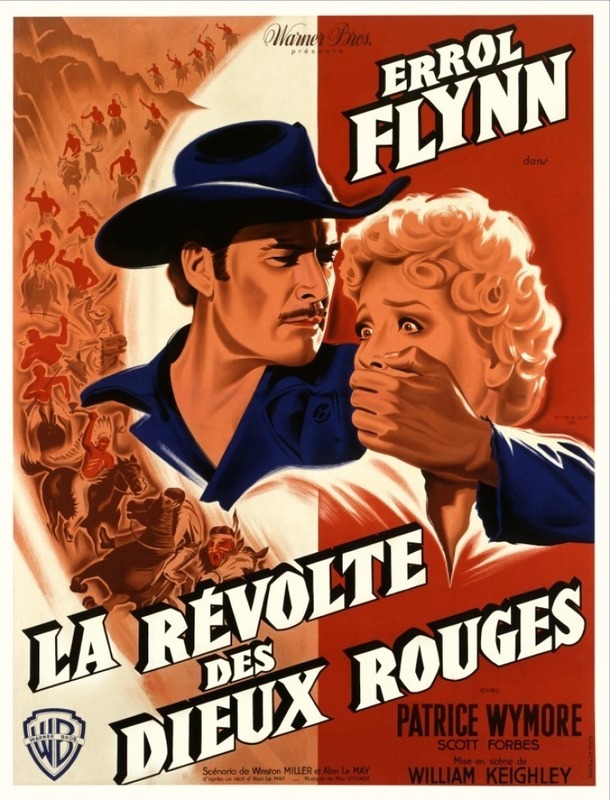 The Plainsman (1936): This highly fictionalized story of Bill Hickok (Gary Cooper) ends with his death in Deadwood. Stagecoach (Luke Plummer, 1939): When the Ringo Kid (John Wayne) arrives in Lordsburg seeking revenge for the killing of his family by the Plummer brothers, Luke Plummer is holding the Dead Man’s Hand. 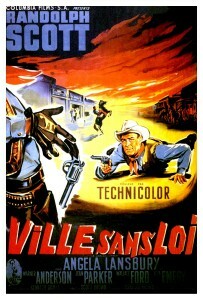 The Man Who Shot Liberty Valance (1962): Loathsome outlaw Liberty Valance (Lee Marvin) holds the deadly cards in this John Ford film. Wild Bill (1995): Wild Bill’s last days in Deadwood include the famous card game in this version from director Walter Hill. 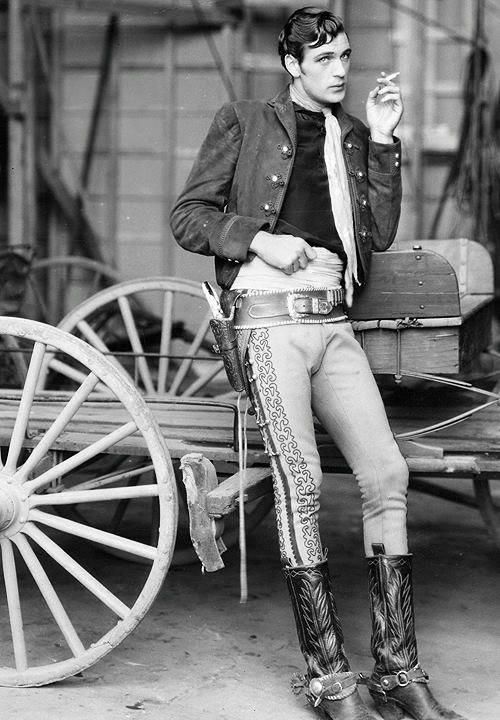 Luke Plummer (Tom Tyler) draws the hand in Stagecoach, 1939. This entry was posted in Lists on December 15, 2014 by Nicholas Chennault. In broad outline, this is a slow-moving easterner-goes-west, collision-of-values story set in modern Montana. 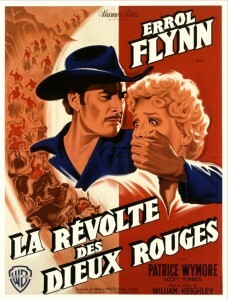 It is also a sort of romance based on a best-selling novel by Englishman Nicholas Evans. The story is set up in New York. Two well-to-do thirteen-year-old girls go riding, and there is an accident on an icy road with a truck. 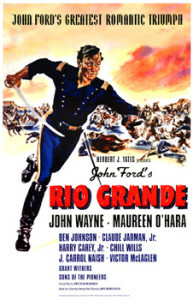 One girl and horse are killed; Grace MacLean (Scarlett Johansson), the survivor, loses her lower right leg and her horse Pilgrim is badly hurt. Both horse and rider are gravely injured in spirit as well as body, and Grace becomes more alienated from her high-powered parents Robert MacLean (Sam Neill), a lawyer, and English-born Annie (Kristin Scott Thomas), a magazine editor. Distance seems to be developing between the parents as well. As Annie researches healing for the horse (as a way of healing her own relationship with Grace), she runs across references to “horse whisperer” Tom Booker of Montana, who has miraculous results with injured animals. 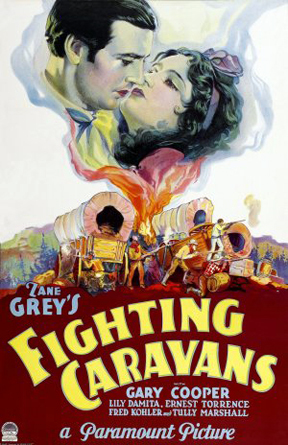 Booker declines to come to New York for consultation, and on an impulse Annie decides to haul Pilgrim and Grace west to Montana, somewhat against Grace’s wishes. 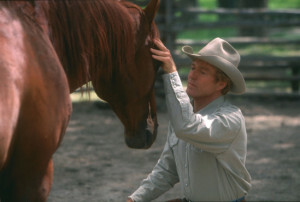 Tom Booker (Robert Redford) gets to know Pilgrim (Hightower). The bulk of the story develops as Annie, Grace and Pilgrim spend time at the Booker ranch, which Tom (Robert Redford) runs with his brother Frank (Chris Cooper) and Frank’s family. Tom is divorced, having once married a cello player he met while studying engineering in Chicago but who found there was “too much space” in Montana. Results come slowly, both with Pilgrim and with Grace. As they are exposed to ranch life and Booker family relationships, both Annie and Grace also start to come out of their shells. Frank’s wife Diane (Diane Wiest) is a practical, earthy type, who helps hold the emotional life of the extended family together. Annie loses her editor’s job in New York, and finds herself being drawn to the taciturn Booker in his own world. She also finds different rhythms in ranch life than she has been used to in New York. 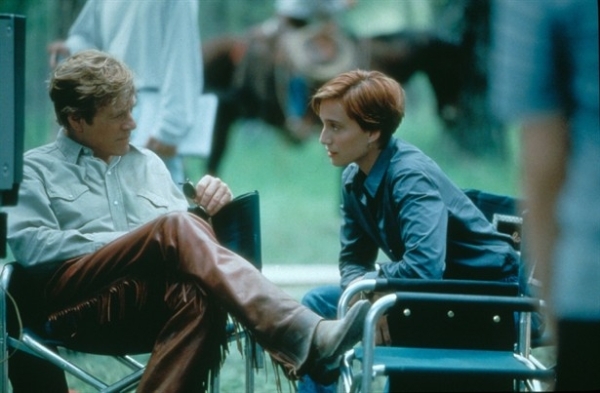 Annie MacLean (Kristin Scott Thomas) and Tom Booker (Robert Redford) go riding. As Annie and Tom draw closer, time passes, and eventually Robert comes from New York to see what’s going on and if he can reclaim his family. Pilgrim is doing better, but it’s very slow going. Finally, Grace does ride Pilgrim as a kind of healing milestone for both of them. 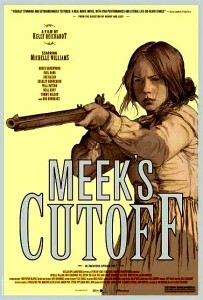 She flies back to New York with her father, while Annie wrestles with when, and whether, to go back. Of course, Booker being the kind of man he is, she has to go back. 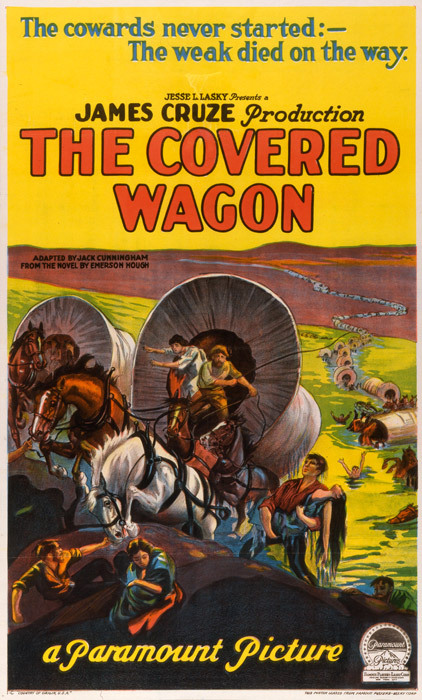 One could say that there are pacing problems with this movie. 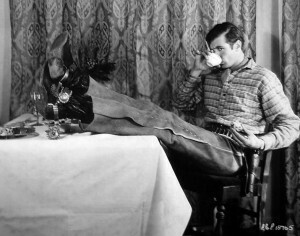 After all, the unrushed set-up takes 45 minutes to tell what could have been done in fifteen or fewer, and the entire film is almost three hours long (170 minutes). But that’s part of the point of the whole enterprise: healing and finding yourself take time, patience and honesty, which are all in short supply in the modern world. In the end, you have to approach this willing to go with its flow, but it works well on that basis. Time, as well as the land itself, seems to be different in western Montana. 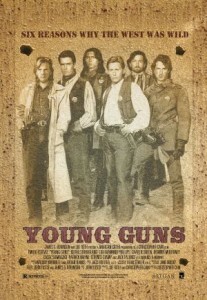 Robert MacLean (Sam Neill, center) comes west to see about getting his family back. 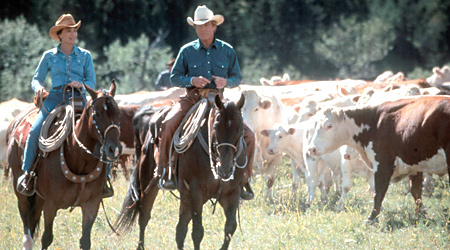 The depiction of ranch family life through Frank’s family and partnership with his brother Tom are very successful. The casting is excellent. Chris Cooper is perfect as Frank Booker, and Diane Wiest, who seems a very New Yorky sort of actor from her other roles, is also very good as Frank’s wife. 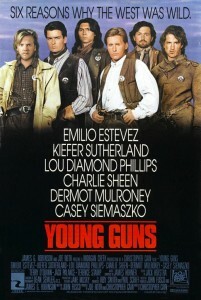 Young Ty Hillman as Frank’s son Joe is very good, too, although he hasn’t been seen much since this film. Sam Neill does well in the thankless role of the underappreciated good husband, and Scarlett Johansson’s performance as Grace is mostly persuasive and helped propel her toward her current success in movies. 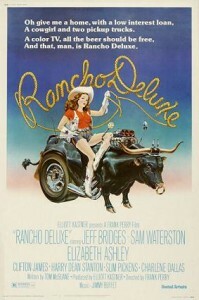 This was Kate Bosworth’s first movie; she plays Grace’s friend who doesn’t survive the accident. 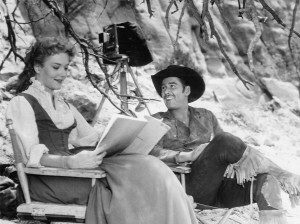 Jeanette Nolan (often a mother-figure, as in Hangman’s Knot, 7th Cavalry, Saddle Tramp, The Man Who Shot Liberty Valance) plays the mother of the Booker brothers; it was her final film appearance. Redford as Booker is the spiritual center of the movie, and this casting is perfect. He bought the movie rights to the book before it was published, so he cast himself. Despite the fact that he was then 62 and Scott Thomas was 24 years younger, Redford looks great and the relationship is believable. Scott Thomas does well, although she doesn’t seem as unique in this role as the weathered Redford does in his. 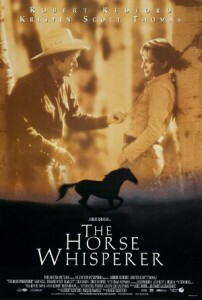 It’s hard to see this without wanting more of Redford in westerns, but he shows up mostly in them when he was much younger: Butch Cassidy and the Sundance Kid and Jeremiah Johnson are the most notable, of course, and then there’s The Electric Horseman with Jane Fonda, another modern western. 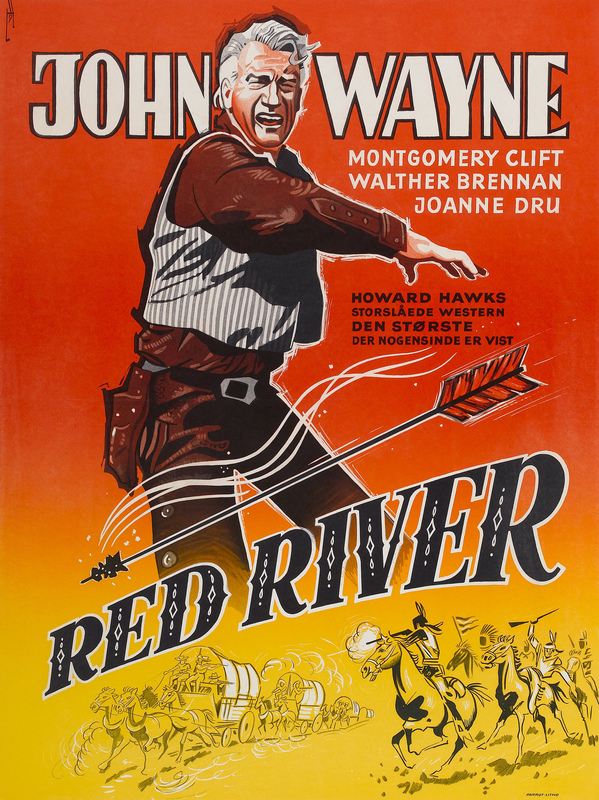 Most similar in spirit to this is another beautiful Redford-directed film set in western Montana of the 1920s and 1930s: A River Runs Through It, with Craig Sheffer and Brad Pitt (1992). 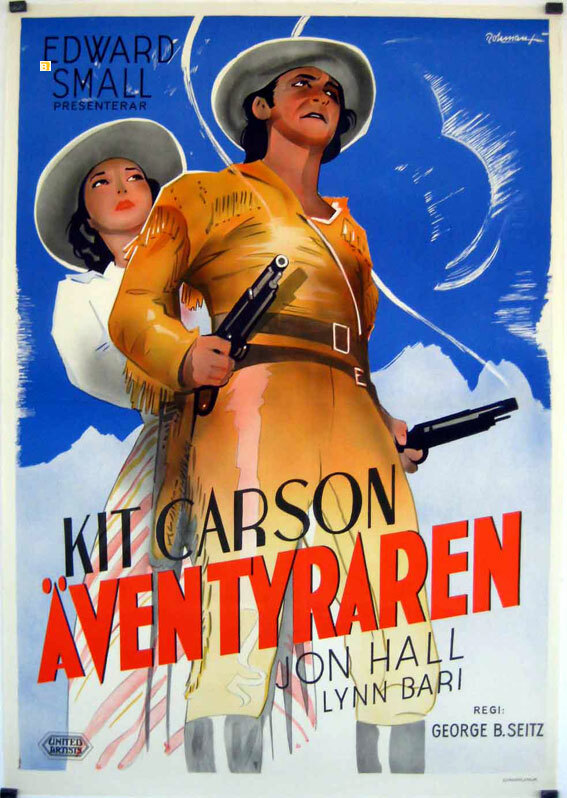 Overall, this is primarily a romance, but it has a very western spirit and look about it. The romanticized landscape is very Redfordian. 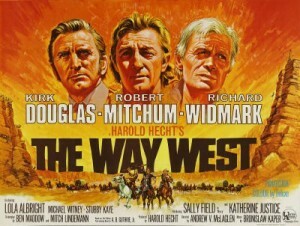 Part of the leisurely pacing is given to spectacular cinematography by Robert Richardson (a number of well-integrated aerial shots), with a good, but spare, screenplay by Eric Roth and Richard LaGravenese. Shot on location in western Montana, near Livingston and Big Timber. The credits list as an “equine technical adviser” Buck Brannaman. 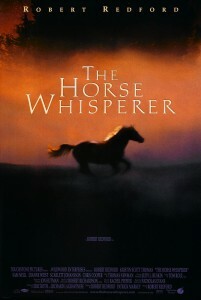 An actual horse whisperer in real life, Brannaman is also the subject of a 2011 documentary entitled simply Buck. This entry was posted in Westerns Worth Watching and tagged Robert Redford on December 8, 2014 by Nicholas Chennault.